Beetroot has been dubbed as a 'superfood' multiple times over the past few years and for good reason. Bursting with deep and earthy flavours, this ruby red veggie is jam-packed with nutrients and vitamins, as well as plenty of health-promoting properties. In the name of weight loss, many of us rely on various fad diets. These fad diets may give us the desired results but only have short-term results. In fact, following these fad diets can be harmful in longer run and before we realise it, we regain the weight that we had lost. Therefore, to avoid such mistakes, one must start eating healthy foods and include all the food groups in their diet like fibre, proteins, complex carbohydrates, minerals, vitamins and low-fat foods, and pair them with other foods that complement them. Moreover, health experts and nutritionists recommend including more and more seasonal veggies in our diet and one such veggie is beetroot. Beetroot has been dubbed as a 'superfood' multiple times over the past few years and for all the good reason. Bursting with deep and earthy flavours, this ruby red veggie is jam-packed with nutrients and vitamins, as well as plenty of health-promoting properties. According to the book, 'Healing Foods', by DK Publishing House, "They may look tough, but beets are a delicate vegetable with a unique group of antioxidants, known as betacyanins. These pigments give beets their strong colour and are the source of their medicinal benefits, which includes supporting liver, improving blood circulation and purifying the blood." Beetroot is packed with healthy minerals and vitamins. The veggie comprises a lot of fibre, which helps keep you satiated for a longer time. Therefore, it is an ideal veggie for people who are watching their weight. Moreover, beetroot is very low in calories; 100 gm serving of beetroot contains only 43 calories, 2.8 grams of fibre and 10 grams of complex carbohydrates. The best way to eat beetroot is to toss it in salads, sandwiches and soups. Better still; consume beetroot in its juice form. 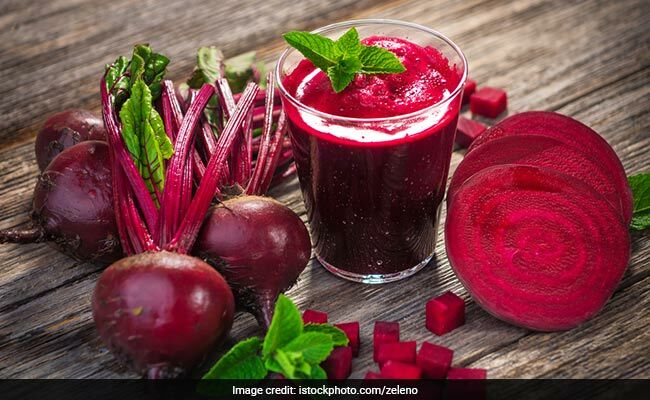 Here are some interesting recipes of beetroot that you can try at the comforts of your kitchen. Stay healthy and fit!